A plush cushioned pillow top is the favorite attribute of this upholstered ottoman. A living room accent piece crafted in a contemporary furniture style, this modern footrest features smooth flowing lines with a tight pulled upholstery appearance. Exposed wood block legs create a solid sturdy look of geometric design. 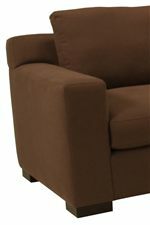 A plush cushioned seat provides a place to rest weary legs while creating an aura of comfort and soft relaxation. A family styled piece full of luxurious class, this upholstered footrest ottoman is available with or without its coordinating accent chair. The 1095 Plush Upholstered Ottoman with Exposed Wood Feet by McCreary Modern at AHFA in the area. Product availability may vary. Contact us for the most current availability on this product. The 1095 collection is a great option if you are looking for furniture in the area.